This week’s artist grew up in the heart of London, played piano in his father’s restaurant, swept onto the pop scene, caught tuberculosis…and nearly died, then retired and all by the time he was 19. He recovered, returned to the pop scene and became one of the most successful singer/songwriters of the 1970s before giving it all up for religion. 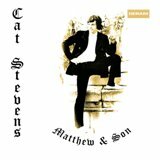 This week I look into Cat Stevens’ second and biggest UK hit, Matthew and Son. In 1966, Mike Hurst of the Springfields was impressed when he hear Cat sing and helped him record some demo tracks and in-turn get a record deal with the newly-formed Deram label which was being launched by Decca. His debut hit, I Love My Dog which Cat said, “It was actually true, that song! I found a little dog, one of those sausage dogs, tied to a lamp post outside Foyles. No one was claiming it, so I took the dog home. The song was about him.” then came Matthew and Son. Only a small part of that song is based on a truth – the title. It was whilst he was riding on a London bus that he saw a sign in a solicitor’s window and by the time his journey was complete he had the whole song in his head about the entire depressing life of a downtrodden office worker whose work was never finished. The story portrays his life from the time he leaves home and becomes part of the hustle and bustle of the manic London rush hour always thinking about what he had to do that day. Matthew and Son, which also became the title of his debut album released in April 1967, reached number two in the UK singles chart, only held off by The Monkees’ I’m A Believer. The track also featured the session keyboardist Nicky Hopkins on piano. Nicky had played with the like of the Kinks, Harry Nilsson, Donovan and the Rolling Stones. Cat charted a number of hits in the seventies including Lady D’Arbanville, about his girlfriend Patti, Moon Shadow, Morning Has Broken, Can’t Keep It In and (Remember The Days Of The) Old School Yard where he was backed by Elkie Brooks. His only hit not written by him was a cover of Sam Cooke’s Another Saturday Night in 1974. As a writer a number of artists have successfully covered his songs; The Tremeloes did Here Comes My Baby (1967), Paul & Barry Ryan did Keep It Out of Sight (1967), P.P Arnold, Rod Stewart and Sheryl Crow all had hits with The First Cut Is The Deepest, Jimmy Cliff and Maxi Priest did well with Wild World and Boyzone Took Father and Son to number two in 1995 and then Ronan teamed up with Cat (by now called Yusef) to record another version of the song and yet again went to number two. It all changed in December 1977 when Cat decided to give it all up and convert to the Islamic faith, a decision he made following a holiday in Marrakesh in Morocco and a year later he changed his name to Yusef Islam. It had its drawbacks over the years like in 2000 when The Israeli government decided to deport him because of allegations that he was giving money to the Palestinian organisation Hamas, a claim he denied and again in September 2004 whilst on a flight to Washington he was told that he was denied entry to the USA because his name was flagged up as being on a ‘no fly’ list and the plane was diverted to Maine. He was held overnight and sent back the UK the next morning. Five years later he wrote a song about the incident called Boots and Sand and featured guest appearances by both Paul McCartney and Dolly Parton. He slowly resumed his music career in the mid-nineties and in 2003 made his first public appearance in over 25 years when he appeared, with Peter Gabriel, the man who’d played flute on the aforementioned Lady D’Arbanville, at Nelson Mandela’s 46664 concert where he sang Wild world. He began to perform more and more both on stage and in the studio and his latest album, The Laughing Apple, was released just seven weeks ago.